I might make a new one, or I might leave it. Who knows, I'm fickle like that. I'm not sure if it's the changing of the seasons or maybe it's just that we're mourning the end of summer (unless of course you are in the southern hemisphere, lucky ducks) but lately there has been a hue of homesickness peppering some expat posts (I'm no exception). Now I'm not talking about anything whiny, just observations on the duality of our lives and how confusing it can be emotionally at times... Molly's post, Life in Another Country, Casey's about her struggle between home and home, and Alex's post about being home in Houston compared to being home in Germany all struck a cord with me. Ladies, I feel ya, and Nicole does too, her post about dealing with homesickness has some helpful tips for those blue days. There isn't a single expat living in a country where the native tongue is different to their own that hasn't suffered at least one lost in translation moment. And of course these moments are usually embarrassing... Ella knows what I'm talking about. She made the hilarious mistake of asking her French husband to top up her wine glass in front of one of his French friends, but of course it came out all wrong (so very wrong). That's one French lesson that has been seared into my brain. Thanks Ella. And the story over on Bread is Pain about a miming incident gone wrong in a Chinese KFC is well worth a read. Get ready to LYAO. Now if you happen to be in Russia, and dating a Russian man (you never know), then Polly's post about useful Russian phrases for a first date might help you avoid any pitfalls. Now if you've been around here before, you know that I'm a big rugby fan, which isn't a bad sport to follow if you're living in western Europe, but not as good as football (I'm talking soccer here). I for one am not a huge football fan, however I would like to go to one match for the ambiance because European football fans are flat out nuts and I'd like to experience that nuttiness first hand. Rachel got to when she went to a Barcelona match. Not a bad club to cut your teeth on. It's Sunday and I have to start preparing lunch (Sunday lunch is BIG in France) so I've gotta run, but not before telling you about a new series that I L-O-V-E love (which happens to be about food so it's a nice little segue)... Marissa's series, Recipes From Italian Moms. If you like Italy and you like food, then this is for you. Check and check. 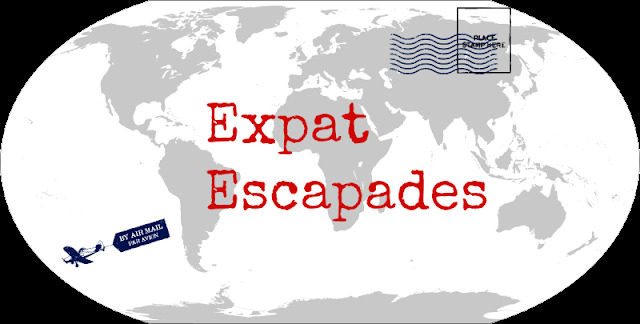 I am privileged (gosh that's an annoying word to spell) to be featured on your expat escapades! You are welcome to come excapading in the Languedoc anytime! I've been feeling homesick too recently. Last week was particularly bad and I think the changing of the seasons is part of it as I could quite happily be in London enjoying the rain with my friends thank-you-very-much South of France. Anyway, I'm flicking my way through the other posts and giggling away at the language mishaps. Thanks for sharing these. The little online gallivanting around the world is quite happily replacing a Sunday morning paper reading routine, although I may need to pop off and buy croissants before France shuts down at 12pm. I definitely think the changing f the seasons contributes to homesickness, especially this time of year. Holidays and family traditions, sports all those things are reminders of the other place we call home. Definitely going to check out the Italian recipes! Thanks for sharing! Thanks so much for including me Sara!! That post was actually surprisingly easy to write one night at 1am (I think it took all of 30 minutes- I was typing FAST! ), but so so so difficult to post!! I think Anna and Deanna nailed it- must be the changing of the seasons because I've been in one of those funks this past week. ugh! haha I'm heading out on a long run and hopefully that vanquishes it for a bit! Then I'm sitting down to read these lovelies!!! Can't wait! Have a great Sunday! While living in Argentina ... the most confusing thing for me was the opposite seasons thing. While Autumn is my favorite season, Oct and Nov were Spring. Which was nice after a dreary wet cold winter but then, Christmas was in the heat of Summer. So I totally get the Homesick due to the Season feeling .. Thanks for giving me a lot to read! You rock! And oh yes, I love Italian food! I will definitely have some pasta tonight! I hope you are enjoying your Sunday, Sara! Thanks for the mention! As always, I'm glad to have some good Sunday reading. Oh I love this arrangement on the expat escapades. And seriously, if the earth could just flip flop right now so we could be in teh south, I'd be really ok with it. as much as i hated those low points and the awkward moments, i miss expat living so freaking much! Heh, your comment about language and lost in translation made me giggle. I am British but when I moved back to England after 25 years in South Africa, plenty was lost in translation even though technically I was a British expat returning 'home'. Now I've settled into the identity of 'serial expat'. My husband is South African, South Africa is home and we might well return one day. 'Serial expat' sounded better than 'confused'.